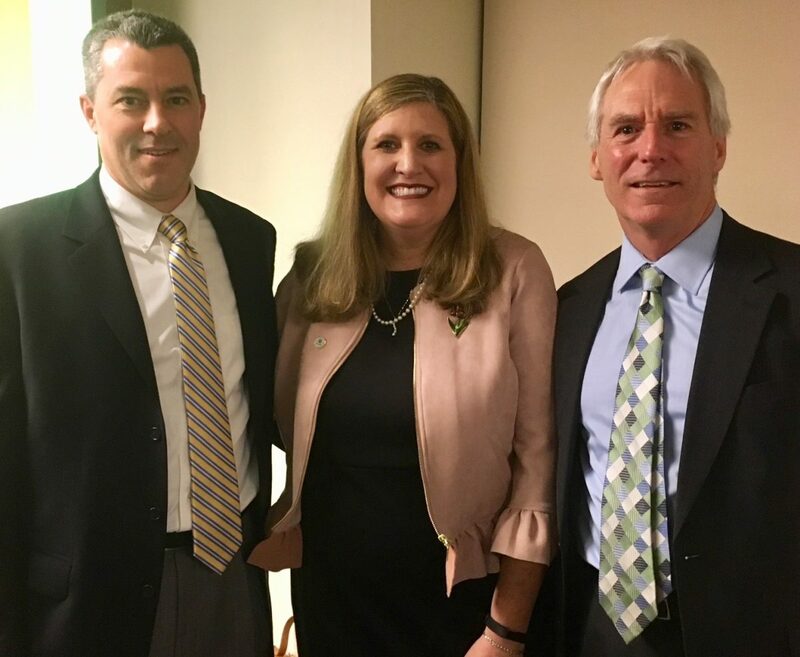 Tom Mackie and Peter Durning were honored to be a part of the Boston Bar Association and Environmental Business Council of New England’s co-sponsored program on February 15, 2018 welcoming the new EPA Regional Administrator, Alexandra Dunn. Tom, Chair of the EBC, gave opening remarks welcoming over 200 guests from the legal and environmental consulting community to the event. Peter, the Co-Chair of the BBA’s Energy and Environmental Law Section, provided closing remarks and a sincere thank you to Regional Administrator Dunn, following a 40-minute presentation and a robust question and answer period. 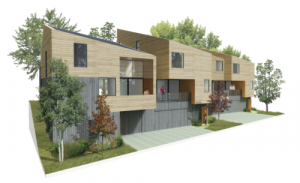 In her speech, Alex Dunn stressed the need to address core water quality concerns by focusing on nutrients in stormwater, stormwater runoff, and water infrastructure projects. She also outlined other initiatives for her tenure as Regional Administrator, including emerging contaminants, environmental justice, interstate air shed issues, and finally closing out and potentially redeveloping the remaining Superfund sites in New England. Yesterday, the Executive Office of Energy and Environment (“EEA”) launched the first phase of its Energy and Environmental Information and Public Access System (“EIPAS”). EIPAS currently provides two portals: ePLACE provides citizens access to information on EEA and agency permit applications and final decisions, as well as to submit and view public comments on permit applications; whereas, the Data Portal contains MassDEP permit, inspection, facility and enforcement data. According to the release, EEA will update data daily, a tall but very helpful order. Currently, EIPAS covers online permitting for DCR, MDAR, and MassDEP including virtually all MassDEP air quality permits. So far there are no mandatory regulations requiring online filing. Other types of MassDEP permits, such as solid waste permits, are not yet ready for electronic submittal. The site indicates that it hosts applications submitted online since May 5, 2017, but so far there are no entries. MassDEP is reviewing on-site wastewater systems regulated under 310 CMR 15.00. There has not been a change in design flows since 1978 (except for one bedroom elderly housing units). There have not been major revisions since 1995 when certain Title 5 innovative/alternative systems were approved (RSF, FAST, BIOCLERE, ORENCO, RUCK). Additional pilot, provisional and remedial systems can be viewed on the MassDEP website. Septic systems are the largest source of nitrogen pollution in Cape Cod embayments. Traditional Title 5 systems do not remove nitrogen. Falmouth and the Buzzards Bay Coalition are conducting a pilot program to reduce nitrogen from homes on West Falmouth Harbor. Using grant money, 20 homeowners will upgrade their old systems with “layer cake” systems which have multi-layer leach fields to remove nitrogen. Septic tank effluent passes through a layer for nitrification (18 inches of sand), for denitrification (mixed sand and sawdust, which causes nitrogen gas to dissipate into the air), and then discharge through gravel layer to groundwater. Testing in Florida showed 85% removal of nitrogen. Early results in Falmouth show 88% removal. The systems will be monitored for three years. The regulatory review should dovetail with the groundwater discharge permit regulations at 310 CMR 5.00 to potentially change the requirement for private wastewater treatment facilities and to allow innovative treatment under Title 5 for flows greater than 10,000 gpd to 15,000 gpd. The costs for hydrogeo investigations, permitting, purchase, and O&M for wastewater treatment plants is prohibitive. Conventional, innovative and alternative systems can treat effluent at significantly lower costs than treatment plants. In June, President Obama signed into law a revised version of the Toxic Substances Control Act (TSCA). Originally passed in 1976, TSCA was designed to have EPA evaluate chemicals to determine if their use required further regulatory control. As TSCA was implemented it came under considerable criticism because it required the government to have evidence that a chemical posed a risk before it could require testing which could result in greater regulatory control. The new TSCA changes this approach and mandates a review of chemicals in commerce and a requirement that all new chemicals must be assessed against health-based standards – rather than under a cost-benefit standard in the original legislation. On June 29, 2016, EPA released its First Year Implementation Plan under the revised TSCA. The aggressive plan includes a timeline for establishing new rules under the legislation including regulations for setting criteria to identify high priority chemicals and an “Inventory Rule”, that would require industry to report the chemicals it manufactured or processed in the previous ten years. The First Year Implementation Plan also set a schedule for the continuation of on-going projects to identify risks from TCE and chemicals involved in paint removing applications, especially the chemicals methylene chloride (MC) and methylpyrrolidone (NMP). One of the few times that the Obama administration and Congress were able to find common ground last year resulted in a dramatic increase in fines under federal environmental statutes. The Bipartisan Budget Act of 2015 included a provision to amend the Federal Civil Penalties Inflation Adjustment Act of 1990 (Sec. 701 of Public Law 114-70). The amendment included a “catch-up” provision that enabled agencies to adjust their penalties to account for inflation since the date the specific penalty was enacted or previously adjusted. There was a 150% cap placed on the rate of increase, but many of the penalties under the environmental statutes administered by EPA increased dramatically. For example, penalties under the Clean Water Act for permit violations under § 1319(d) increased from $25,000 per day of violation to $51,570. Similarly, administrative penalties under CERCLA increased from $25,000 to $53,907 and from $75,000 to $161,721 respectively. On July 1, 2016, EPA released the Interim Final Rule that includes the Table that will be incorporated in 40 C.F.R. § 19.4 with a complete rundown of the environmental statutes and fees. Going forward we will likely see continued increases because the Act implements annual reviews of statutory civil penalties and allows agencies to make annual adjustments without going through the rulemaking protocols of the Administrative Procedures Act. We will also see settlements demands dramatically increase in NPDES citizen suits under the CWA. This Spring, Governor Baker announced that he is directing MassDEP to proceed with the steps to have the state administer the National Pollutant Discharge Elimination System (NPDES). Massachusetts is one of just four remaining states that do not administer the federal NPDES program at the state level. Taking over the local administration of the NPDES program will be a multi-year process, but MassDEP has started the process. Hopefully more local control will lead to more responsive interactions between the regulators and the regulated community, as the state and industry work together to implement best stormwater management practices for the benefit of our water resources. In August, MassDEP released proposed draft revisions of the Air Regulations at 310 CMR 7.00. The topics addressed by these proposed regulations include: (a) establishing thresholds for greenhouse gas emissions that will require a Plan Approval; (b) requiring Plan Approvals for non-major modifications of existing Prevention of Significant Deterioration (PSD) permits; (c) updates to Reasonably Available Control Technology (RACT) requirements for volatile organic compounds; and (d) revised procedures for administrative review of an air permit issued by MassDEP. The comment period on the proposed regulations closes on Monday, September 26, 2016. You might find race results from an old turkey trot or an article about an awards ceremony, or you might find unflattering (or compromising) photos of yourself – particularly if you went to college in the age of digital cameras on cell phones. But how often have you Googled your business or industrial facility to see what the web reveals about your environmental compliance history? With the continued emergence of technology and the federal government’s push for greater transparency, most of the environmental compliance documentation maintained by the Environmental Protection Agency (“EPA”) is now available on the web. The database includes filings under RCRA, the Clean Air Act, and the Clean Water Act, as well as data from the Toxics Release Inventory and Greenhouse Gas Reporting Program, among several others. In addition to stating a facility’s compliance history, including required periodic reports and disclosures, the ECHO website also includes information on inspections and enforcement actions conducted by EPA. All of this information is easily available to the general public with a simple search. The data can be accessed by company or facility name, but it is also searchable by state, city or ZIP Code. This capability makes it easy for individuals to learn about facilities in their neighborhood, or perhaps to allow competitors to find out information about a rival’s compliance history. Another significant use for this database is by groups seeking to bring citizen suit enforcement actions against industrial actors. For example, in the Clean Water Act arena, the Conservation Law Foundation (“CLF”) and Clean Water Action, have both been very active in bringing citizen suits under the Clean Water Act against industrial facilities that either failed to file under the multi-sector general permit (“MSGP”) for discharges to waters of the United States, or facilities that have permits, but have not met their reporting obligations, or their obligations to undertake corrective actions. Simply using the information available through the ECHO database CLF, Clean Water Action, and others can identify industrial facilities that should have permits under the National Pollution Discharge Elimination System (“NPDES”) program. Using the ECHO search tools, the citizen suit organizations can quickly find the reporting history for any industrial facility that holds a NPDES permit. This is particularly relevant in Massachusetts and New Hampshire where EPA is the NPDES permitting authority. Just letting their fingers do the walking from their desktop computer, the environmental organizations can assess whether a facility has filed the requisite number of quarterly reports, complied with its annual reporting obligations, and even assess whether or not the facility has exceedances of benchmark monitoring values. As an illustration, here are the ECHO search results for industrial facilities in Newburyport, MA. A user can click on each orange marker and learn about the business’s compliance and enforcement history. Since many of these facilities may have discharges that lead to waters of the United States, environmental organizations searching for Clean Water Act compliance might be particularly interested in canvassing this area for compliance targets. After a quick assessment of the compliance history available from ECHO, it is easy for the environmental organization to prepare a 60-day notice letter and initiate the process of bringing a suit under the Clean Water Act. Once that process is started, the environmental organization will stand in the shoes of the federal regulator and impose a financial penalty on the facility for failure to comply with the requirements of the MSGP. In most instances, the environmental organization will also demand operational or structural changes to eliminate or reduce pollutants in a facility’s discharges, and require Supplemental Environmental Projects (“SEP”) related to the impacted water-body to offset impacts to the environment. In addition, under the federal Clean Water Act, the environmental organizations are entitled to recover their attorneys’ fees and legal costs for bringing these private enforcement actions. All of these components result in significant financial burdens on the target facilities. With the new MSGP permit promulgated by EPA earlier this year, industrial facilities in MA and NH have even greater obligations to provide transparency for their compliance with the Clean Water Act. The 2015 MSGP requires facilities to either post the contents of their stormwater pollution prevention plan (“SWPPP”) on the web, or include the contents of the SWPPP in the facility’s Notice of Intent for coverage under the 2015 MSGP. The 2015 MSGP also requires online reporting of quarterly and annual monitoring events. With the transition to all online reporting, all of a facility’s Clean Water Act reporting obligations will be available with the click of a mouse. The 2015 MSGP set September 2, 2015 as a deadline for facilities with existing MSGP permit to file a new Notice of Intent for coverage under the new general permit. For facilities with an existing MSGP permit, this is an easy target for citizen groups seeking to make a quick strike. We are aware of two actions against industrial facilities simply for failing to meet the September 2, 2015 deadline for filing a new Notice of Intent under the 2015 MSGP. Similarly, even though facilities may have met the benchmarking requirement of four consecutive quarters without any exceedance under the old 2008 MSGP, which allows the facility to transition to annual rather than quarterly monitoring, the new permit re-starts the clock and facilities must show a minimum of four consecutive quarters of monitoring data to demonstrate compliance with the benchmark values for the particular facility before shifting to annual reporting. While the general availability of all this data sounds alarm bells about the tidal wave of compliance information on the web and the increased potential for citizen suit actions, there are also some business advantages that web-savvy companies can reap from this wealth of data. For example, companies looking to make an acquisition can use the ECHO database to perform quick due diligence on an industrial facility before any formal deal negotiations take place. A review of the ECHO database will allow a potential acquirer to identify good targets, or to recognize a facility to avoid, given their compliance history. Similarly, companies in the certain industries can use the information available through ECHO to evaluate the compliance history of the facilities receiving their outputs as part of their due diligence obligations to establish defenses under the Superfund Recycling Equity Act (“SREA”). Armed with a potential receiving facility’s compliance history under Federal environmental laws, an arranger can make an informed choice about whether or not to sell scrap products to a particular customer. Generators of solid and hazardous wastes can also check the compliance status of handling and disposal facilities, perhaps avoiding the cost of a full facility audit or the liability that would arise from shipments to a non-compliant facility. Lastly, the ECHO database can also serve as a public relations tool. Since this compliance data is available to the general public, industrial facilities should be aware of the potential public relations burden and benefit these disclosures can provide. In addition to the importance of maintaining strong environmental controls, we recommend that industrial facilities monitor how their business information is presented in the ECHO database. Proper management could lead to new opportunities and positive public relations, while lax attention to monitoring and reporting obligations could invite citizen suits to environmental organizations trawling the ECHO database for new victims.